This anti-invasive mania is not merely a local phenomenon. It is the official position of the federal government, as expressed by the State Department, that “invasive alien species pose one of the most serious threats to our environment, affecting all regions of the United States and every nation in the world.” In February, National Invasive Species Awareness Week was celebrated in Washington, complete with a reception on Capitol Hill. Last year, the federal government spent more than $2 billion to fight the alien invasion, up to half of which was budgeted for glyphosate and other poisons. That’s small change, nativists argue, when measured against the damage such interlopers inflict on the national economy. The Department of the Interior claims that the annual tab is $120 billion. But this number comes from a 2005 report by David Pimentel, an ecologist and scholar at Cornell, whose dislike of aliens apparently extends to the human variety, as evidenced by his public opposition to both legal and illegal immigration. Pimentel extrapolated at least some of his findings from such dubious assumptions as the dollar value of grain consumed by each rat in the United States. In an earlier paper, he concluded that cats were costing us $17 billion every year, after calculating that our furry (and, in his view, non-native) friends kill an annual 568 million birds, and arbitrarily valuing each bird at $30. On close examination, other examples of the damage said to be caused by exotic invaders look no less questionable. 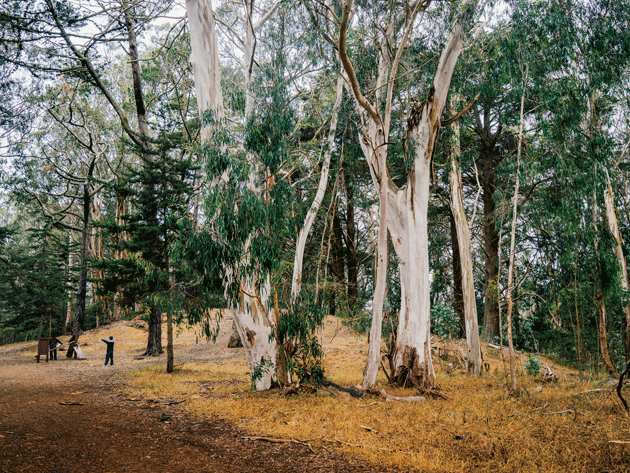 The supposedly supercombustible eucalyptus, for example, survives fires that consume surrounding plant life — and rather than unfairly appropriating water, the tree actually irrigates soil by absorbing moisture from the coastal fogs through its leaves and funneling it out through its roots. (Though still cited as the prime culprit in the devastating 1991 Oakland firestorm, the eucalyptus was in fact cleared of responsibility in a FEMA report.) Monarch butterflies belie its reputation for repelling wildlife, the eucalyptus being their favored wintering abode in California. As for the tamarisk, it consumes no more water than the beloved cottonwood, native to the Southwest. Nor, contrary to rumor, is it inhospitable to other species, as certified by the endangered southwestern willow flycatcher, which delights in roosting amid the tamarisk’s foliage. According to Matthew Chew, a historian of biology at Arizona State University, the tree’s sorry reputation dates to a ploy during the 1940s by a local mining corporation, whose operations required enormous quantities of river water — which had already been allocated to local farmers and other businesses. The solution was to generate studies demonstrating the heinous quantities consumed by the thirsty tamarisk. The destruction of the trees would theoretically free up huge quantities of “new” water in the rivers, which could then be used by the selfsame mining corporation. Then there is the zebra mussel. This immigrant from the Caspian Sea is a perennial target of the nativists, thanks to its tendency to reproduce in vast numbers, encrust jetties, clog water-intake pipes, and crowd out God-fearing American mussels. But zebra mussels have successfully filtered pollution in the notoriously filthy Lake Erie and other waterways, thus promoting the revival of aquatic plants. The mussel also feeds a growing population of smallmouth bass and lake sturgeon. It is the common reed, however, that has inspired one of the most determined and dubious campaigns of extermination. Phragmites is accused of robbing other plants, fish, and wildlife of essential nutrients and living space. Delaware has responded by spraying and respraying on an annual basis a 6,700-acre expanse of the Delaware River estuary with thousands of gallons of glyphosate-based weed killer. In 2013, locals in the Hudson River community of Piermont, New York, discovered a plan to destroy a 200-acre reed marsh fronting the town. Outraged, they fought back. “We love the marsh,” an indignant Marthe Schulwolf, who is active in opposing the scheme, told me. “It’s beautiful, a living environment, with lots of wildlife, and it protected us from the Hurricane Sandy storm surge.” The townspeople were especially alarmed to learn that the state’s “toolbox” for eradication included heavy spraying of herbicides — glyphosate being the customary choice — right next to two playgrounds. Mark Davis, a professor of biology at Macalester College and a frequent critic of anti-invasive hysteria, put it more pungently. “It’s the same perspective as ISIS wanting to re-create the seventh-century caliphate,” he remarked. “It’s ecological fundamentalism, the notion that the purity of the past has been polluted by outsiders.” Far from crowding out native species, he argued, invasives tend to move into areas that have been ravaged, or at least disturbed, by human activity. They are, in other words, a symptom, not a cause. Cogongrass is one striking example, but the same pattern recurs with many vilified species. Ailanthus, a salt-friendly seaside tree from China, spread inland from the East Coast along the fringes of America’s interstates, tracking the salt religiously spread by highway departments during winter snowstorms. If the anti-invasive movement rests on such debatable foundations, why has it flourished in this country, winning endorsement from activists, local, state, and federal bureaucracies, and respected academics? It’s not as though hostility to newly arrived plant species has been a great American tradition.1 In California, the eucalyptus was once universally cherished for its graceful and colorful appearance in a land often devoid of trees — indeed, during the 1870s, it was planted by the hundreds of thousands. A century ago, the tamarisk was promoted by the U.S. Army Corps of Engineers as an ideal means to prevent soil erosion in the Southwest. Even kudzu was once hailed as the “Lord’s indulgent gift to Georgians”: government nurseries grew millions of seedlings and distributed them to farmers as a restorative for depleted soil. Every time I pause to consider whether I have gone too far out on a limb, I look at the new facts that continue to pour in from around the world and conclude that I have not gone far enough. . . . The time has long since come to take more political risks — and endure more political criticism — by proposing tougher, more effective solutions and fighting hard for their enactments. These uplifting sentiments were not always matched by actions. Critics noted Gore’s championship while in Congress of the $8 billion Clinch River breeder-reactor project, riddled with fraud and bribery. They also pointed out his legislative maneuvers on behalf of the Tellico Dam, on the Little Tennessee River, a $100 million boondoggle denounced by David Brower, the founder of Friends of the Earth, as “the beginning of the end of the Endangered Species Act.” Following the 1992 election, former Gore staffers moved into key environmental posts at the EPA and elsewhere. There they would benefit would-be polluters such as Disney (which had just been fined for dumping sewage in the Florida wetlands) and food processors (irked by a 1958 ban on carcinogens, soon to be repealed under the 1996 Food Quality Protection Act). Gore sprang into action. He reassured Graham that Clinton’s circle of scientific advisers had already established a Biodiversity and Ecosystems Panel, which would “be considering the issue of invasive species and will report their recommendations at the end of the year.” The panel’s chair, he noted parenthetically, was Peter Raven. The official White House biography of Peter Raven listed him as the director of the Missouri Botanical Garden, and noted that he held a professorship at Washington University in St. Louis. That description failed to convey the full reach of his power and prestige as America’s leading botanist. Wade Davis, an ethnobotanist at the University of British Columbia, describes Raven as a “total force of nature. He took a staid Midwest botanical garden and put it on steroids, turning it into the greatest institution of its kind on earth.” A former president of the American Association for the Advancement of Science, Time magazine Hero for the Planet, chairman of the National Geographic Society’s Committee for Research and Exploration, Raven was (and is) a hugely influential figure, with a network that extends through academic, government, and corporate bureaucracies. Collectively, all human beings, including Americans, are playing a crucial role in the sixth major extinction event to occur in the course of more than three billion years of life on Earth. . . . During the history of the United States, more than 500 of its known species have been eliminated (half of these since 1980) by various causes, including destruction of habitat by human activities or invasive species. The Monsanto Company could not have put it better. This was not surprising, since Raven (who retired in 2010) and Monsanto were close, both geographically and financially. The Missouri Botanical Garden was located just a few miles from Monsanto headquarters in St. Louis, and it owed much of its explosive growth to the beneficence of the corporation, which was in the process of changing its public identity from a chemical manufacturer and purveyor of Agent Orange to a “life sciences company” — one heavily invested in GMOs. In April 1996, Monsanto CEO Robert Shapiro joined Raven to break ground for the Monsanto Center, a four-story structure designed to house the garden’s unique collection of botanical books and dried plants. Monsanto had contributed $2 million toward the center’s construction, and had also donated the land and $50 million for the Danforth Plant Science Center, another GMO-intensive research facility. While Monsanto played God during the 1990s, the Clinton Administration had its back — a policy consistent with its corporate-friendly approach to environmental issues. When, for example, the French balked at allowing GMO corn into their country, the president, the secretary of state, the national-security adviser, and assorted U.S. senators pleaded Monsanto’s cause. (The French finally caved when Gore himself phoned the prime minister to lobby on the corporation’s behalf. )2 In addition, Washington’s revolving door whirled many Clinton Administration officials onto the Monsanto payroll, while the president’s committee of science and technology advisers included Virginia Weldon, the corporation’s senior vice president for public policy. 2 For years, Monsanto’s MON810 corn was the only GMO crop cleared for cultivation within the European Union. In May 2014, however, the French parliament reversed its earlier policy and banned the crop as a threat to the environment. The Raven panel’s recommendation to join battle with invasives got rapid traction. “The invasion of noxious weeds has created a level of destruction to America’s environment and economy that is matched only by the damage caused by floods, earthquakes, wildfire, hurricanes, and mudslides,” cried Interior Secretary Bruce Babbitt when the report was released. Within a year, Clinton signed Executive Order 13112, creating the National Invasive Species Council “to prevent the introduction of invasive species and provide for their control and to minimize the economic, ecological, and human health impacts that invasive species cause.” Among the founding members of the council’s advisory committee was Nelroy E. Jackson, a product-development manager and weed scientist for Monsanto who had helped to develop Roundup formulations specifically for “habitat-restoration markets” — that is, for eradicating invasives. Such divine status was assured by its symbiotic relationship with Monsanto’s bioengineered corn and soybeans. The strategy worked. Farmers were planting GMO crops in ever-increasing amounts — from just over 4 million acres worldwide in 1996 to 430 million in 2013. The results of this exotic intervention were not so positive, however, for Raven’s treasured biodiversity. The larva of the monarch butterfly, for example, feeds exclusively on milkweed, a plant that glyphosate is tremendously effective at killing: unlike other herbicides, it attacks the milkweed’s roots. As the rain of glyphosate increased, surpassing 141,000 tons on U.S. crops in 2012, the butterfly’s food supply dwindled to the vanishing point. In 1995, at the dawn of the Roundup Ready era, a billion monarchs fluttered over America’s fields; by 2014, the number had fallen to 35 million, and there was talk of declaring the butterfly an endangered species. Raven remains optimistic about the monarch, citing Monsanto’s “very exciting” plan to foster milkweed growth in noncultivated areas. Such natural oases, however, are few and far between in the Corn Belt. Those that remain are likely to host other invasive plants, such as garlic mustard, denounced as a “serious invader from the east” by Iowa State University, which inevitably recommends “spot applications” of glyphosate as a remedy. Meanwhile, the growth curve in glyphosate use has steepened, thanks to a practice that began in 2004. Late in the season, many farmers are now spraying the compound on crops that are not bioengineered to resist it, in order to kill them off and produce artificially early harvests. Over the years, there have been repeated allegations that glyphosate is dangerous for humans — charges vehemently denied by Monsanto and its friends in high places. “Table salt and baby shampoo are more toxic, or as toxic, as glyphosate,” Rand Beers told 60 Minutes in 2001. Beers, George W. Bush’s assistant secretary of state for international narcotics, was defending the U.S.-funded spraying of a glyphosate-based compound on millions of acres in Colombia as part of an effort to wipe out coca plantations. Despite Beers’s dutiful denials, however, the mixture turned out to be a lot more dangerous than baby shampoo, afflicting the population with painful rashes and other ailments. It also did a fine job of wiping out the vegetables and poultry that made up the local food supply, while often failing to kill the coca plant, its intended target. Then came a massive speed bump. This past March, seventeen scientists met in Lyon, France, under the auspices of the International Agency for Research on Cancer, an arm of the World Health Organization, to assess the carcinogenic potential of several chemicals. The group was led by Aaron Blair, an internationally renowned epidemiologist and the author of more than 450 scientific papers, who spent thirty years at the National Cancer Institute. Among the chemicals they evaluated was glyphosate. As Blair explained to me, the group reviewed three kinds of data: lab tests on animals, epidemiological studies on humans who had been repeatedly exposed to glyphosate, and “mechanistic” analyses of the ways in which the compound could cause cancer. The French government agreed, promptly banning the sale of Roundup by garden stores in response to Blair’s report. The Colombian authorities meanwhile halted the coca-spraying program, over U.S. government protests. The program had not been a huge success, of course, given the target plant’s remarkable ability to survive the spray. But unintentional glyphosate resistance is not confined to coca. Although Monsanto scientists had deemed such a development nearly impossible for weeds targeted by the Roundup Ready system, species subjected to prolonged exposure began to adapt and survive even as farmers were harvesting their first bioengineered crops. “It’s a disaster,” said Benbrook. “As resistant weeds spread and become more of an economic issue for more farmers, the only way they know how to react — the only way that they feel they can react — is by spraying more.” It has now become common for farmers to spray three times a season instead of once, and Benbrook estimates that the extra doses of herbicide will add up to 75,000 tons in 2015. In other words, a very alien invasive, made right here in America.